Oakland County offers Michiganders more than excellent shopping, dining and events. It demonstrates exemplary retirement planning. In contrast to the majority of Michigan counties that promise employees more retirement benefits than their revenues can cover, Oakland County is nearly 100 percent funded according to its Comprehensive Annual Financial Report (CAFR). Deputy County Executive Robert Daddow credited these savings to the county’s forethought in adopting a defined contribution, 401k-type plan in 1994. The change paid off. Three years after switching to defined contribution plans, the county was fully funded. Laurie Van Pelt, a member of the pension board, noted that first year savings alone topped $3 million adding up to a present day savings of $107 million in total. The county also benefited from risk sharing with employees. Even with risk sharing, employees still opted for the benefits of Oakland’s defined-contribution plan. Most employees, including Daddow and Van Pelt, converted to defined-contribution retirement plans due to their portability, decreased vestment time, shared risk, no max out date, and the opportunity to leave funds with beneficiaries rather than the county should an employee pass away. Oakland businesses have also benefited from the county’s cut in unfunded liabilities. Most counties are in much worse shape. The average funded ratio for Michigan counties is approximately 74 percent, according to an analysis of the county CAFRS. This means that the average Michigan county has unfunded liabilities equal to a quarter of its promised benefits. The average local municipality is in even worse shape. In response, many counties are making the switch to defined contribution plans, but it isn’t easy. He recommended that counties simply close their defined benefit plan to new employees. That way, the county can transition away from its pension system while avoiding the hassle and cost of switching employee plans and crashing into an unpredictable market. But before counties can even begin to address those questions they must first overcome the opposition of political leadership and public-sector unions. There are two pieces of legislation that can help with that. One is currently in place and the other has been proposed. House Bill 4804 is sitting in committee right now. The proposal gives local voters the power to prohibit unions from re-opening a defined-benefit plan during collective bargaining once it has been closed. Public Act 54 of 2011 also helps put municipalities on the same playing field as unions. The law prohibits automatic wage hikes after a contract has expired. Both Daddow and Van Pelt expressed their thankfulness for PA 54. 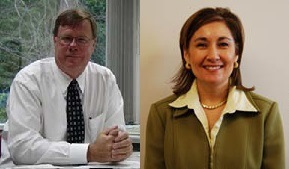 Despite PA 54 of 2011’s success, Daddow and Van Pelt fear that its benefits could be short lived.